Now that Christmas crafting is over for the season, I'm going back to a few works in progress that need to be finished to create a clean slate for the new year. First, my navy Eva. I was planning on finishing it for my cousin's wedding back in November, but I still haven't finished it. Working on it is super easy- a simple crochet pattern that turns out beautiful. There is also the vest of doom- a knitted cabled vest that I have been working on for my brother for nearly 3 years now. 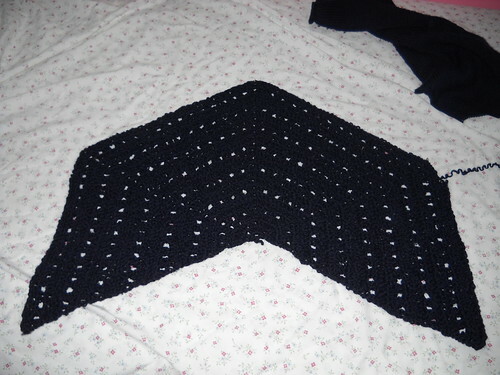 The pattern is great, but it is not a mindless project, making it a hard TV knit. For other, better examples of WIPW, check out Tami's Amis! I've done a few of those projects of doom before. But, with little ones, if I can't easily stop what I'm doing to take care of something for them, it's not getting done. The navy Eva looks lovely.